The Hickory Oval and Rectangular Table and Chair Covers from Classic Accessories are made from durable Weather10 material featuring a rugged fabric outer layer with a laminated waterproof and wipe-clean inside coating. Weather Leather trim looks authentic but wont rot. Medium covers table and 6 chairs up to: 88 L x 58 W x 23 H.
Fast protection when storing or on the job. Protects against UV damage, rain, dirt, birds and tree sap. Fits gas or electric log splitters up to 82" L x 45" W x 34" H (when in horizontal position). The Stellex Trailerable Boat Cover by Classic Accessories provides strong protection regardless of your climate. Whether you're traveling down the highway or storing at home, you can count on fade-resistant UV protection that lasts. Tough Rain-Tite fabric protects against rain, snow, sun and dirt and wont crack in cold weather. Fits round tables and 6 standard chairs up to 94 inches Dia x 23 inches H.
Hickory Table & Chair Set Cover - Rectangle/Oval, Medium The Hickory Oval and Rectangular Table and Chair Covers from Classic Accessories are made from durable Weather10 material featuring a rugged fabric outer layer with a laminated waterproof and wipe-clean inside coating. Weather Leather trim looks authentic but wont rot. Medium covers table and 6 chairs up to: 88 L x 58 W x 23 H.
Hickory Table & Chair Set Cover - Rectangle/Oval, Medium is rated 4.0 out of 5 by 5. Rated 5 out of 5 by Gerry from Canada from Quick delivery Well made and fits perfectly. Second one for outside patio set. Stays there all winter covered in snow or ice mostly. Lasts about three seasons in those conditions. Rated 4 out of 5 by Angie from I bought this for my 7 piece patio table and chairs, and it doesn't fit! I'm hoping it will fit o... I bought this for my 7 piece patio table and chairs, and it doesn't fit! I'm hoping it will fit over our sofa and chairs. The quality is great, though. I bought the bigger one to fit our table and am keeping this one, as well. Rated 4 out of 5 by Joe from Seems durable and well made. One key to satisfaction will be to select the right size. I bought ... Seems durable and well made. One key to satisfaction will be to select the right size. I bought this to cover our patio table for the winter. I placed some chair cushions on top of the table before I covered it to help snow and rain run off the surface. Would rate it 5 stars but I don't yet know how long it will last. But I see no reason why it won't last many years. Rated 4 out of 5 by Ro from Excellent quality material and design Just purchased a month ago, this is a little more than what i expected to pay for patio table cover, fits a little big since the table we have is square but the fabric and design, constructed quality material is well worth the investment in purchasing a excellent cover. This will last for many years. In the overview you say the size is: 88 L x 58 W x 23 H. Yet in the specifications you say when assembled: Depth - 130&quot;, Height - 24&quot;, Width - 84&quot;. What are the real dimensions? 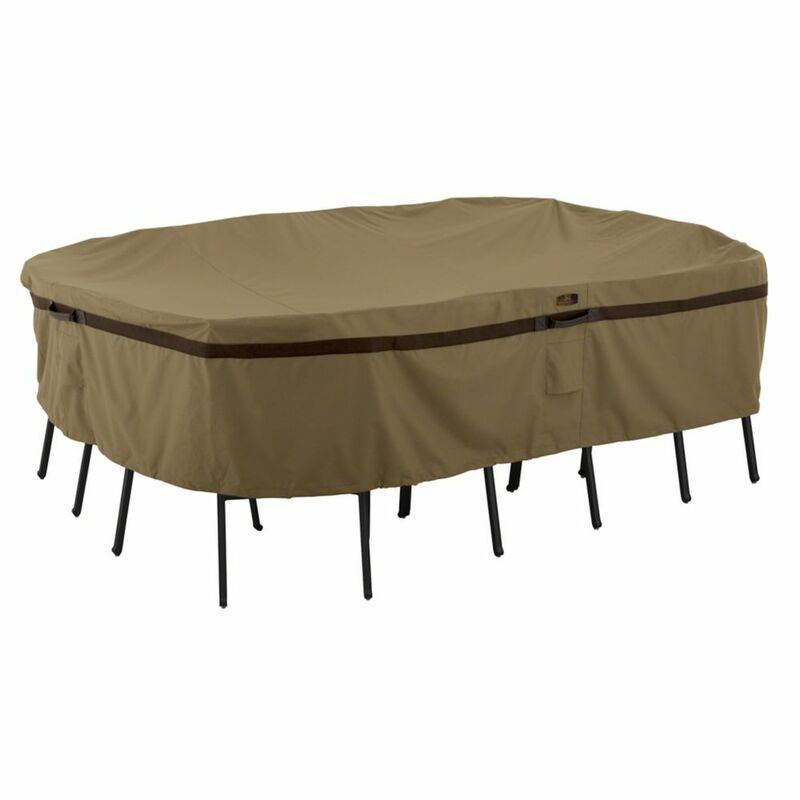 The cover will support a patio set with max dimensions Depth - 130&quot;, Height - 24&quot;, Width - 84&quot;.